Plans to build 36,000 new homes have been approved by Cheshire East Council. After a government inspector found "serious shortcomings" in its original plan for 29,000 properties, the local authority announced 7,000 extra homes. Extra development sites have been allocated, with a number of extra greenbelt sites being earmarked around Knutsford, Wilmslow and Macclesfield. Cheshire East's revised plan will now be submitted back to the government inspector in June. Councillor Rachel Bailey, who is due to become the next leader of the Conservative-run council, said: "We are doing everything possible to progress the Local Plan and to speed up its completion." The authority insisted its previous plan - for 29,000 homes - was criticised by the government inspector only because the borough's economy was likely to grow faster than anticipated. 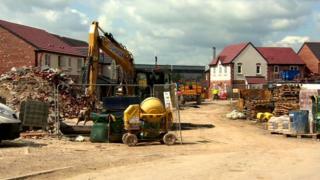 Cheshire East Council has previously described itself as being "besieged" by housing developers. A local development plan would make it more difficult for developers to build on land which has not been earmarked for development.